Due to the importance of music as a cultural, social and economic phenomenon, JAZZON! was incorporated to promote the creation and coordination of the infraestructures that drive the market inside its speciality: the Jazz. By setting closer and promoting the supply and demand, and normalising the proffesional sector, providing activity to musicians. 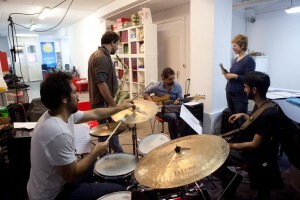 We promote and spread Jazz and creative Improvisation Music in The Basque Country, encouraging and activating the different agents involved: musicians, promoters, producers, institutions… to benefit the professionalisation and regularization of the sector, providing the stability to normalize those music styles at the different stages and levels. We carry out our projects in four areas of action: Promotion and Programing, Trainning and Education, Consultancy and Management and Promotion and Broadcasting. Jazz, broadcasting, promotion, creative Improvisation Music, productive area.